Grow in bright indirect light. Likes humid atmosphere. Keep soil consistently moist during the growing season, but reduce watering somewhat from fall to late winter. Pinch stems to shape as needed. Easily propagated from stem cuttings. Pellionia repens, commonly called wavy watermelon begonia, is native to Southeast Asia. It is an evergreen perennial that typically grows to 4" tall but spreads to 2' wide via stems that root where the touch the ground. In St. Louis, it is grown as a houseplant, often in hanging baskets, because of its attractive foliage. Features fleshy, greenish-pink stems with elliptic to oblong, wavy-edged leaves (to 2.5" long). Leaves are a variable gray-green , with dark green along the edges and variably sized light green to silver patches in the middle. 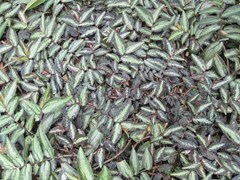 Below, the leaves have purplish margins and are sometimes tinged with pink. Small greenish flowers are inconspicuous and rarely appear on indoor plants. Synonymous with Elatostema repens and Pellionia daveauana. Genus name honors Alphonse Odet Pellion (1796-1868). Good house plant for hanging baskets.